Cats are naturally inclined to climb, scratch, and perch on top of things. All of which can be troubling behaviors when it involves your furniture, but luckily you can help dissuade them by bringing home a cat tree. Of course, it’s not that simple. You’ll quickly learn how many different styles, sizes, and shapes exist and you’ll have to think about what features your cat will be more likely to use. To help take some of the work out of choosing a cat tree for your feline companion, we’ve curated the following selection of brands that goes over the pros and cons of the very best cat trees we’ve come across. No cat tree is perfect for everyone, so we want to help you find the best rated cat trees that would be suitable for you and your cats. This is more like a kingdom or a fortress than a “tree” if we’re being realistic, it has so much space and so much climbing action for your cats to enjoy. It’s sturdy, well-made, and has ample places for your cat to relax in soft plushy goodness, and areas that they can scratch away at to their heart’s content. 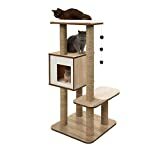 It is definitely the best cat tree for multiple cats that we could find and one of the best quality cat trees on the market. The wide base and anti-tipping hardware keep the cat tree from wobbling as cats jump on and off. This can be a problem with some cat trees, creating a possibly dangerous situation, or at the very least it increases the chances of the tree tipping over and damaging your stuff. Your cat will probably land on their feet and be just fine, but obviously it’s better to have a tree like this one that avoids that situation altogether. The large scratching board at the front of the tree is a great encouragement to keep your cat’s claws away from your furniture. Beyond that, every perch has a scratching area attached to it, so there’s no shortage of scratching room. Attention to detail – from the super soft fabric surrounding the tree to the padded perches and anti-tipping hardware, we can see how much this company cares about feline comfort! The scratching posts aren’t fully covered in natural sisal. Instead, part of each post is covered in plush carpet and we know that won’t hold up as well as sisal does. It’s nice and comfy, though! The tree is built from particle board and while it’s not a deal breaker, we would’ve preferred to see a higher-quality material used. Of course, for a cat tree that is this intricate and large, using a hard-wood would ensure that it costs a small fortune, so it’s a sacrifice that we’re okay with making since it makes such a great design a lot more accessible to more people. AeroMark Armarkat Cat Trees have been a popular choice for around 20 years now and it’s easy to see why! They are built using quality materials and sell for a reasonable price, especially when compared to the competition! This particular model offers two perches, sisal scratching posts, and a condo for added privacy. Compared to the cat tree we featured above, this one only has one little nook for your cat to crawl into, but it’s still got plenty of steps and places to perch, so it’s definitely suitable for multiple cats. It’s surprisingly easy to assemble, it won’t take you more than a small portion of an afternoon to get it ready, which is good because your cat will be all over it while you’re trying to finish putting it together! Easy assembly that takes roughly 30 minutes to complete and comes with all necessary hardware and tools. The faux-fleece lining instead of the usual carpet you see on most cat trees. We think that it looks nicer and will blend in nicely with almost all home decor. The base isn’t quite wide enough for the size of the tree, so it can be a bit wobbly especially with larger cats on the very top. Larger cats (15 lbs. +) might not fit fully on the perches or inside of the condo. The quality of the toys – there have been some issues with the toys quickly falling apart and adding little to the overall function of the tree. Just think of them are purely a bonus, and you won’t be disappointed. You can replace them with better toys. The style is really nice compared to some of the classic grey ones you might picture in your head, and it doesn’t take away from the function. The cute design. Let’s face it, cat trees can be an eyesore, so it’s nice to see that there are trendier options available and a few designs so that you can choose the one that suits your own furniture, so that you and your cat can match! Easy to assemble, taking around 15-30 minutes on average. It also includes all necessary hardware and tools. Like the previous tree, the base isn’t quite wide enough, making it a bit wobbly. Some people help navigate this issue by placing the tree against a wall. While it fits small to medium-sized cats well, this tree will be a bit of a tight fit for larger breeds. 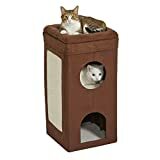 This adorable condo tower from CO-Z is the perfect “home away from home” for small to medium-sized cats. It offers a quaint design and is a good size for most spaces and less agile cats. It looks just like their own little house! Not only that, but it’s got a couple adorable little windows that you’ll catch your cat peaking through if you’re lucky, and a roof that pops off to help you clean things up, which is always a good idea every now and then, even if you have a relatively clean cat. The removable roof on the house. It makes cleaning up messes a lot easier! The ramp makes it easier to less agile cats to climb up and down and provides some vertical room for stretching. Again, the sisal covered poles are an important feature that wasn’t overlooked. It isn’t big enough for large cat breeds and probably won’t work well in multiple cat households. 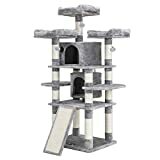 This large cat tree from Go Pet Club is one of the best cat trees for large cats and has a lot going on – multi-levels, ladder, hammock, condo, tunnel, and a couple of spots suitable for perching. It is a good option for multi-cat households as there is ample space to share. It’s also one of the most affordable options on this list if you’re looking at its price to size ratio. There’s a really cool hammock-like attachment that sticks out the side and gives your cat a fun place to lounge around, in addition to the rest of the great places to catch a snooze, including an actual hammock that sits close to the floor. There’s a ladder that they can scratch, a rope to play with, and plenty of other scratching areas throughout the tree. There’s a tall perch on the very job, and lots of little nooks. The amount of space. There is enough room for multiple cats and quality playtime. The sisal covered ladder rungs. What a great way to encourage your cat to scratch to their heart’s content! The fabric covering the tree isn’t the best quality. It’s thin and little pieces of fuzz are known to fall off. There is some minor concern about the overall safety and build quality due to issues with screws not fully tightening, but you’ll just have to be careful when you’re putting it together, and check on the screws every few weeks or every month or so to make sure they aren’t coming loose at all. Another great option from AeroMark, the Armarkat Premium Cat Tree is roomy enough for cats weighing around 20 pounds and can safely support up to 50 pounds. It’s very sturdy and well-made, so this is one of the better options if you have a heftier cat. The condo is in the base on this tree, which is great for kittens or less agile cats. It’s large enough to fit at least two cats too! It’s sturdy, so you don’t need to worry about it accidentally tipping over during playtime. Easy assembly – even those who admit to having trouble assembling toys and furniture say it’s a breeze. Compared to the rest of the tree, the top level is less stable. You can remove it though, if it becomes an issue. The top hole in the roof of the condo seems like a possible safety issue for cats deep into their play with another cat, but it will depend on your cats, their temperaments, and their relationships. Keep an eye on it! If you want an ultra-modern cat tree, look no further. This cat tree from Vesper definitely fits the bill when it comes to modern design and will look sharp in almost any home. It’s made from the same MDF board you’d find in most speakers or sub-woofer enclosures. It looks great, and it can totally incorporate into a lot of living room or den styles, but the downside is that it’s not as nice of a surface for your cat. 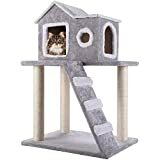 The little condo area has a soft place for your cats to sit, and there are other softer areas, and plenty of scratching poles for them, but overall there’s just a certain coldness to the wood, they don’t have the same grip as they do with cat trees that are covered. Of course, you know your cat better than anyone and how they might like this. If they’re clumsy and often slip and slide around on the kitchen floor, for instance, you may want to pass on this one. If you think the plush cushions are going to be enough for your cat, this is a solid option from top to bottom. Very sturdy, very well made, and looks amazing – so all-around it’s easy to recommend. The stylish design. There’s no carpet on this tree, instead you’ll find plush cushions that are easier to keep clean and should hold up better against your cat’s claws. Stability. This is one of the most secure options on the list, thanks to its wide base. It’s on the pricier side, especially when compared to similar-sized cat trees. If space is a major concern for you and you’re looking for something on the smaller side, you might want to check out this three-tiered cube from MidWest Homes for Pets. It has a neutral design, so it won’t clash with your decor and it doesn’t demand nearly as much space as most cat trees. There are two levels inside, each with their little door for peaking out, and an area on top, too. It can fit in just about any room, it’s easy to move around if you ever want to, and the entire thing is soft and plush. The square base is just under fifteen inches, so don’t get the idea that this thing is tiny or anything, compact is a better word. There’s also a sisal scratching pad on the side to encourage your cat to scratch there instead of scratching up the softer faux-suede on this tree, or your furniture. We love the compact size. It’s perfect for an apartment or bedroom. It’s fully collapsible for easy storage. Even though it’s small, there is enough space for up to 3 cats with 2 hideaways and a bed on top. Not really big enough for larger cat breeds. If you have a big cat, you’ve probably realized by now how difficult it is to find a cat tree large enough to accommodate your cat comfortably. Luckily, Cat Tree King has a solution with their Corner Cat XXL tree. This high-quality tree is huge, and offers two hammocks, a condo on the lowest level, sisal rope scratching poles, and a comfy looking bed on top. It’s very soft, very luxurious, very comfortable… any cat would be lucky to have it. It’s also quite big, so keep in mind that you’re going to have to sacrifice a little chunk of your room, but something tells us you’re not going to mind all that much. The sturdy construction. Everything seems to be put together well, and you should have no trouble with accidental tipping. The base is sturdy, and it’s not top-heavy. The size. This is a great multi-cat tree and provides ample space for larger cats to stretch out and relax. The price. This is the priciest option on the list, so if you weren’t looking to spend too much, you may want to check out one of the cheaper choices we’ve included. Just to add: It’s certainly not overpriced for what you get, it’s a fantastic tree. The fabric that is covering the tree is soft, but we have concerns about it holding up long term, depending on how rough your cats go at it. If they stick to scratching in the correct areas, you’re all set! Also, you could probably reupholster it relatively easily years from now if it starts to come apart. 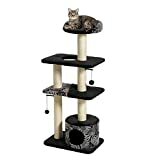 Another compact option for the list, the two-tier scratching post from the Molly and Friends brand is a good choice for those with limited space but want something that is going to be stable enough to hold a larger cat. It offers a perch, tunnel, and sisal rope scratching poles. It has a very cool, almost artistic look to it, so it can look incredible in a lot of different rooms with a lot of different styles. It’s still obviously a cat tree, nobody is going to mistake it for some modern piece of art, but it still looks relatively cool and subdued compared to a lot of larger cat trees, that can admittedly be a bit much sometimes. Built using real wood and high-quality carpet so it will hold up against your cat’s playtime longer. Risk of tipping is low due to the heavy materials used and stable base. Doesn’t take up a lot of precious space. It’s on the pricier side considering its size, but it’s also one of the best looking cat trees and is extremely well constructed, so once again – you get what you pay for! The perch could be a bit longer as it is still a squeeze for longer cats, so this may not be the best option for big cats.